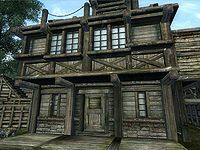 Dro'shanji's House is located on the east side of Bravil's main island, adjacent to Andragil's house and across the street from the Bravil Fighters Guild. The front door reveals a short hall, with two crates and a barrel at the south end, all with clutter. Three apples sit on a table on the west wall, and the north end of the hall leads to a dining room. In the northwest corner of the room sits a clutter barrel, a locked chest that can contain armor and weapons, and a small jewelry chest hidden behind that one. A clutter cupboard sits in each of the other corners of the room, with two clutter crates also sharing the southeast corner. A watermelon sits on top of the cupboard in the southwest corner. A table on the south wall holds two carrots, two potatoes, a pumpkin and a bear pelt. The table in the middle of the room is set with four radishes, two ears of corn, two more potatoes, a loaf of bread, a cheese wedge and a bottle of mead. Another cheese wedge sits on the bench. On the second floor, the first room serves as a sitting area. The shelves in the southeast corner hold a watermelon, a clutter sack and a copy of the Security skill book The Wolf Queen, v 1. Another clutter sack sits on a table on the north wall and a cupboard that holds more clutter sits on the east wall next to the short hallway. At the end of the hall, on the east wall, sits a chest of drawers that contains clothing. In the north bedroom, a locked chest that can hold gold and/or jewelry sits at the foot of the bed, with a set of drawers that contains clutter on the north wall. The southern bedroom holds a single chest of drawers that also contains clutter on the east wall. The chest in the northern bedroom and the two chests in the dining room below, along with the two sacks in the sitting area on this level, are the only containers that do not respawn in the house. Esta página foi modificada pela última vez à(s) 01h01min de 24 de janeiro de 2014.